When Pittsburgh was awakened by heavy downpour Friday morning, many were skeptical about whether the 19th Annual Mobot Races would still take place. But as noon approached, the rain died down to a drizzle and eventually subsided, and a crowd gathered around the course outside Wean Hall. The course consists of a white path drawn on the sidewalk outside Wean Hall. The line starts above the stairs and quickly transitions into a 28-inch downhill drop. The course then becomes a series of winding turns with several small metal gates through which the mobot must pass. After another 46-inch drop, the mobot must face the last part of the course: decisionpoints. In this part of the course, there are several points at the which the white path branches into two and the mobot must correctly choose the one leading to the next gate or else risk following a diverted path that results in a longer course time. 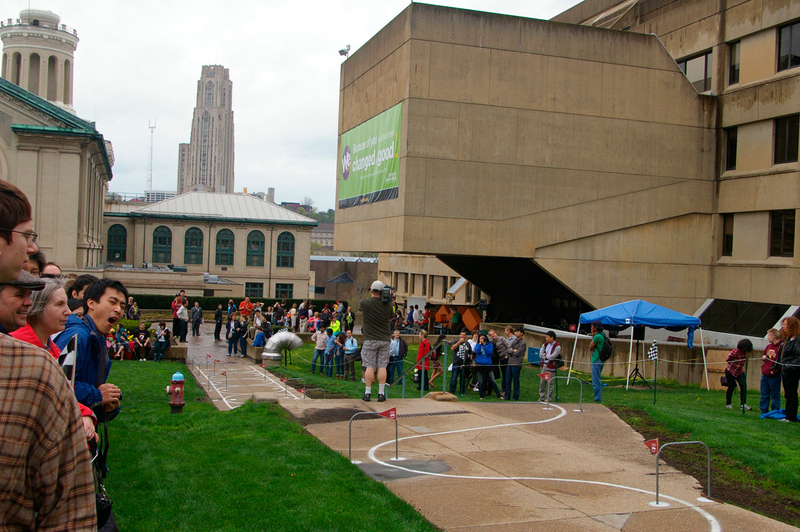 Greg Armstrong, a senior research technician at the Carnegie Mellon Robotics Institute, was the Mobot Race announcer. Dressed in a traditional Scottish kilt and carrying a very realistic-looking sword, Armstrong amused the crowd with fun facts about Pittsburgh as the crowd watched the competitors brave the wet and windy course conditions. The first competitor was StringRay, a one-man team consisting of electrical and computer engineering master’s student Kwabena Agyeman. StringRay could only make it through one gate on its first trial; it was soon followed by three other mobot competitors. Megubot was a father-daughter team consisting of Megan McKelvey, a former C-Mite student, and her father, Terry McKelvey. Revo was a one-man team and consisted of senior electrical and computer engineering major Daniel Jacobs. MoBoss was much larger and consisted of electrical and computer engineering first-years Cosku Acay, Edwin Cho, Kenneth Li, Nishant Pol, and Oguz Ulgen, and first-year mechanical engineering major Sam Zeng. The results of the 19th Annual Mobot Races are as follows: in the Open Class category, StringRay took first prize, passing through Gate 5 with a time of 1:08.48; in the Exhibition category, Megubot got through Gate 11 with a time of 1:31.25; in the Undergraduate category MoBoss received first prize, moving through Gate 12 with a time of 1:48.37, and Revo received second prize, moving through Gate 9 with a time of 1:12.10. The Mini-Challenge, which occurred the Wednesday before the Mobot Races, consists solely of the race course between the two drops (before the area with decision points). Revo completed the Mini-Challenge in 33.36 seconds and MoBoss completed it in 24.86 seconds. One time, after the crowd cheered loudly for a mobot passing through a gate, the mobot jerked toward the side and ran off the track. “Maybe the mobot had sound sensors,” a man in the crowd mused. “Did we scare it?” While this prediction is probably far-fetched, there were many other factors that affected the performance of the mobots. For example, since it rained before the start of the races, there were patches of the concrete that were wet and darker than the rest of the sidewalk. Some of the mobots had trouble finding the white line in such patches. 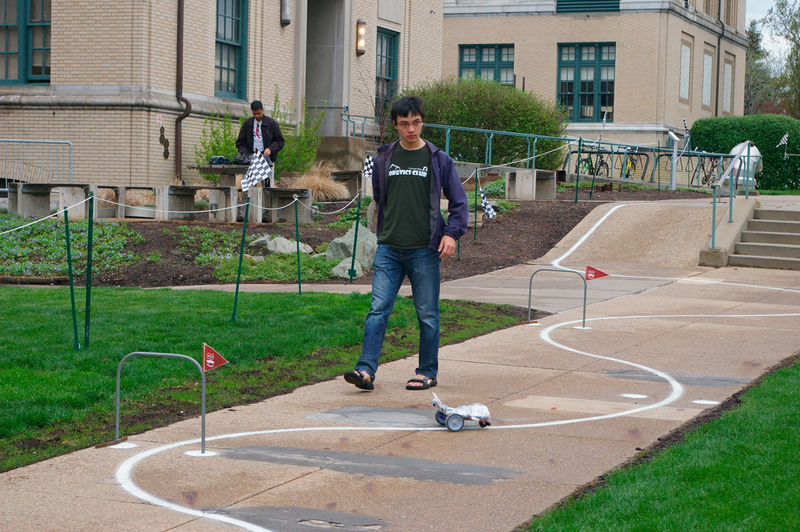 We walk past the mobot course on our way to class every day, but what we don’t realize is how difficult it is to build a robot with the reasoning capabilities to navigate along the white path through the metal gates. This year’s Mobot Races showed us just how challenging a task it is.